Prime Minister David Cameron says he will only appear in one of the televised pre-general election debates, drawing the fire of party leaders and political pundits who have accused him of cowardice. In an email sent from Downing Street on Wednesday to the chair of the debates committee, it was revealed the PM’s final offer, following the “chaos” of negotiations, would be to only take part in one debate featuring leaders from seven political parties. He will not take part in a head-to-head with the main opposition leader, Labour Party chief Ed Miliband. 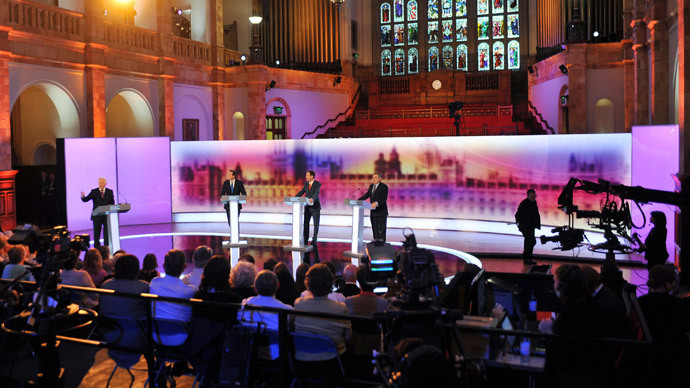 The latest proposals from broadcasters outlined four live debates, scheduled to take place throughout April. The first debate will feature the leaders of the Labour Party, the Conservatives, the Liberal Democrats, the UK Independence Party (UKIP), Welsh nationalist party Plaid Cymru, the Green Party and the Scottish National Party (SNP). The pre-election debate season was to conclude with a Cameron-Miliband faceoff.
.@David_Cameron why are you running scared of TV debates? The British people want a head-to-head TV debate. Let's give it to them. The email was published hours after Labour leader Ed Miliband challenged the PM to a showdown at a time or place of his choosing. “I will do it any time, any place, anywhere,” Miliband jeered. The prime minister responded, saying he wanted to "unblock the logjam" the "broadcasters helped to create". "Let's get on, let's have the debate that matters the most," added Mr Cameron. By putting forward a proposal for a debate with seven leaders, "we'll actually see one take place", he said. Cameron’s decision has sparked outrage amongst politicians and commentators who believe he is “running chicken” from the debates. “This is an outrageous attempt from the prime minister to bully the broadcasters into dropping their proposals for a head-to-head debate between David Cameron and Ed Miliband. “That it comes only hours after Ed Miliband called David Cameron’s bluff and said he would debate him any time, any place, shows the lengths David Cameron will go to run scared of a debate with Ed Miliband,” he added. Nick Clegg spoke to LBC radio on Thursday morning, offering to step in should Cameron fail to make the final leaders debate. He also accused Cameron of “lofty pomposity” on the issue. A Green Party spokesperson said Cameron’s decision would have dramatic repercussions for the electorate. “This swerve by Cameron will further damage trust in our political system. Not only is Cameron’s announcement cowardly but it also shows his contempt for the electorate. People want to see a set of debates between all major party leaders, yet the prime minister is clearly scared of scrutiny,” they said. Isabel Hardman, a columnist at the Spectator, called the PM a “chicken,” branding it hypocritical to shirk the debates having previously claimed they were essential. “The prime minister is indeed running chicken from televised debates because he does not believe he will benefit from them. From a campaigning point of view, that is perhaps fair enough, but it is not a fair enough reason for scuppering debates that you once insisted were important for engaging voters and were here to stay,” she wrote. Ed Miliband also gave a frank warning to the prime minister on Sky News.